QuikQ LLC, a privately held software development company based in Franklin, Tenn., announced it has been awarded North American VAR Partner of the Year by Impinj Inc.
Impinj, a provider of ultra-high frequency (UHF) RFID solutions used to identify and authenticate items, has awarded QuikQ this honor for it’s SmartQ cardless fueling system and DFConnect transaction software. The SmartQ system is a cardless fueling program that uses RFID technology to initiate transactions at the fuel island instead of requiring the presence of a card to facilitate the process. It offers a faster and more efficient way for commercial vehicle drivers to fuel while also reducing fraudulent transactions and streamlining the entire fuel purchasing process. 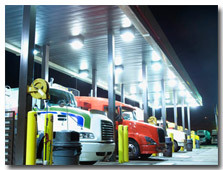 More than 1,000 SmartQ systems utilizing the Impinj Speedway Revolution RFID Readers have been installed at truck stops and travel centers nationwide.